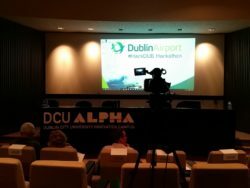 The Dublin Airport Hackathon was a weekend hacking event (for coders and makers) run by DCU Alpha and DAA which produced some interesting projects and prototypes, both in the areas of runway maintenance / inspection and overall passenger experience within the terminal. UPDATE: A somewhat edited (style, syntax, NPOV) and much more readable version of this post can now be found on Irish Tech News. Note: This post is personal opinion. I was an attendee only, neither a participant nor involved in the organisation of the event. I’ll update this post with links to sponsors, team names, and other coverage as soon as I get them. If I miss anything, just comment below or get in touch. First prize, EUR €7000, went to “Air Ally” with the idea of replacing the need to download an airport app by providing greater functionality – such as real time flight information, wait times and personalized navigation – on the wifi login / hub page. I broadly agree that airport app adoption is an issue (see TNooz post from earlier this month) and I like the idea of asking for the flight number up front, but I’m not clear on the mechanism. Can a mobile browser page containing a web app remain active and continue to push notifications? Second prize, EUR €3000, went to “Runway Wall-E”. This is essentially a fleet of small robotic RC cars that could traverse runways carrying various sensors including digital cameras (allowing image recognition to spot debris) and weather / visibility / luminosity detectors. The team actually built a working prototype – one of several pitches that implemented hardware at the event. Wall-E was a good example of how this was not just a software hackathon, several teams made use of on-sight hardware support and 3D printers. SITA gave the prize for best use of their developer.AERO APIs to “Gate Mate”. Gate Mate is essentially a pre-bookable device (based on a generic mobile with a luggage or trolley clip) that would provide location aware assistance through the airport journey – providing voice notifications on where to go and when to start walking. The target audience would be customers with special needs – essentially anyone needing navigation or logistical help but not necessarily a wheelchair. Starting on Friday afternoon we heard brief presentations from the API / technology partners including SITA (aeronautical APIs), Intel Ignition (Hardware), Asavie / Vodafone (IoT), Emutex (divers), RS Radionics (hardware), Pivotal (app foundry), ESRI (GIS) and Firmwave (IoT). 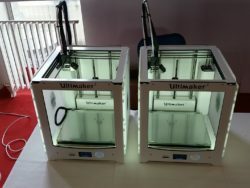 In addition to free use of their hardware and software, the vendors donated significant time, staying around for the entire event to provide expert advice to the teams. The next set of presentations were from DAA themselves. 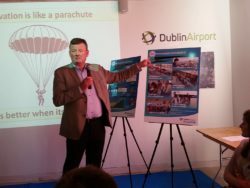 These were very interesting and educational, providing a deep insight into the operations of Dublin airport both on the passenger side and on the tarmac. Speakers included Brian Drain (GM Operations), Kevin Conheady (Airside Ops), and Ian Devine (Airfield Asset Care). I think this section alone was worth the price of admission for me. After that, participants were invited to pitch their idea – within 60 seconds. 31 people in total went forward to pitch an idea. Although some people arrived at the event with an existing concept, many were new on the night. I can honestly say none of the ideas were bad. There was certainly some overlap between the pitches (navigation a common theme) and also with existing travel tech, but that is really not a problem in this kind of event. Participants were mostly new to travel and there is time to develop ideas and take a unique slant on them. There followed a period of voting on the ideas – both by audience and by judges – to determine the 12 pitches to proceed into the two days of hacking. Dub-Base – Spoken audio alerts from your mobile to your headphones on where to go and when. CheckApp – NFC based replacement of currently paper based (all manual, unverified) safety checks prior to driving a heavy fleet vehicle (HFV). Social Airport – A social channel / chat room for people boarding the same flight from the same airport. Pingin (@pinginapp) – My personal favorite – although they didn’t pick up any prizes. PingIn offers points based micro-incentives for passengers to arrive at the right place at the right time (not too early, not too late). Customers earn points which can be redeemed for F&B or other benefits. Prompts and time targets can be personalized – so capable of reducing crowding at gates by dividing up an airplane load of passengers based on their boarding sequence. I think there’s a lot of potential for this kind of incentive scheme wherever there are bottle necks and crowding issues. Reflect Action – A “smart” mirror for use in public bathrooms, offering a brief Yes/No prompt on quality of bathroom and the ability to aggregate data and notify facility managers. Team LiDAR – Van mounted LIDAR to inspect the runway surface at high speed with millimeter accuracy using lasers (or image processing – I’m not sure if it was one or the other or both). AirPortal – Mobile app with personalized navigation within the airport. They used FLIFO APIs, wait times, and location services (beacons). InstaShop – Mobile app with facebook login which also scans boarding card, then provides personalized / location aware promotions and retailing offers, as well as ability to book / pay on the phone. This may solve some of the customer awareness issue that airport retailers have today. Buddy Band – A wearable device to allow parents to track the location of children in airports and other large crowded public spaces using their smart phones. Potentially applicable to other use cases – transfer passengers, un-accompanied minors, etc. In summary – a lot of these ideas overlap, but not in a bad way, each team took a very unique slant. There’s clearly a set of use cases around navigation and personalisation of the airport experience whether it is for improved retailing or servicing special needs. Likewise, the automation of currently manual/visual safety inspections has the opportunity to both increase safety and capacity at airports. 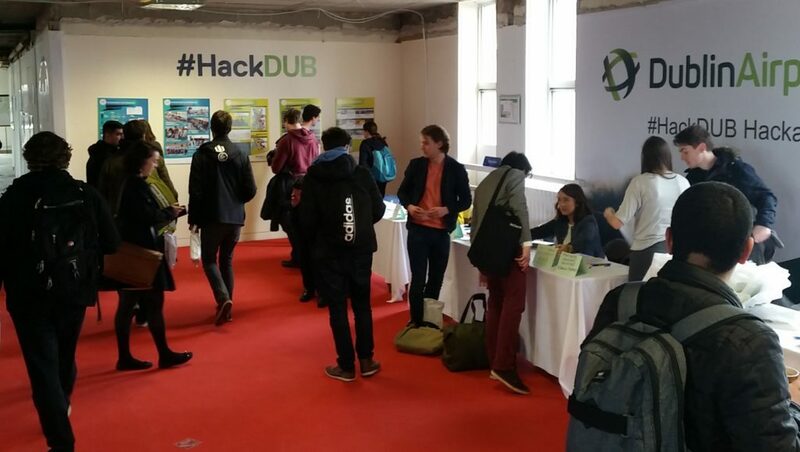 I think DAA can take away several innovative ideas from this event, and I hope DCU revisit the travel technology space again in a future hackathon. > Can a mobile browser page containing a web app remain active and continue to push notifications? Firefox 48 will support it (Q3 this year). The current Firefox version is 45. So it is possible but 55+% of phones used by Dublin Airport App are iPhones so not really a suitable for short term and complete replacement. Still they could get rid of the the Android App with a Progressive Web App which has these features and more. Thanks for the feedback Gianfranco – very useful links also. I need to read up a bit more on Progressive Web Apps – they sound promising for improving customer engagement and getting from mobile search results to mobile web site to usable, always-on utility but without going via the app store. In other words – the strengths of an app, but none of the discovery issues. From a marketing perspective I like that. But I can see problems also! Firstly, it looks to me that Google are the only people talking about it. Secondly, will users trust the websites/brands enough to let them work this way? An app by any other name is still an app. The transition from “website I happen to be visiting”, to “functionality embedded on my phone” will require a pretty robust user interface and a good deal of trust on the part of users. I also don’t see this working well with Apple’s closed eco-system philosophy.